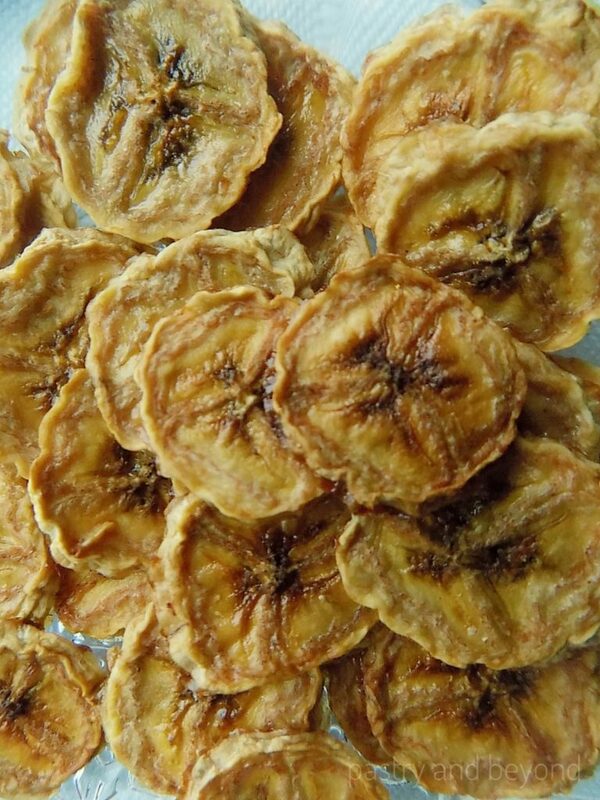 You can learn how to make dried bananas. You need to slice bananas and dip the slices into lemon juice to prevent bananas from turning brown. Sweet and tangy! It is time to eat healthy as I start gaining some weight after recipe testings(they are coming soon). 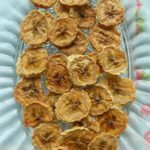 So today I am sharing healthy snacks which taste so good: dried bananas 🙂 They are sweet and tangy. I love dried fruit when they are chewy/crispy. This is how I make them. It takes time to dry the fruits. 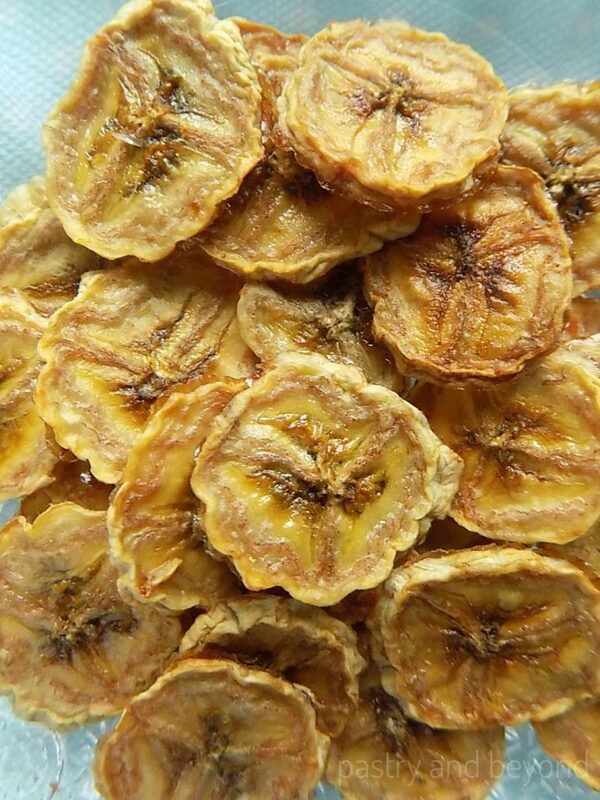 Even for this chewy/crispy dried bananas, you have to bake them at low heat for 2 and 1/2 hours. After 2 and 1/2 hours, the edges will become crispy and the middle will be chewy. They will become crispier as they cool. If you want to eat them all crispy, you need to bake them longer. Additional 30-45 minutes will be enough to make them crispy. We need bananas and lemon juice. 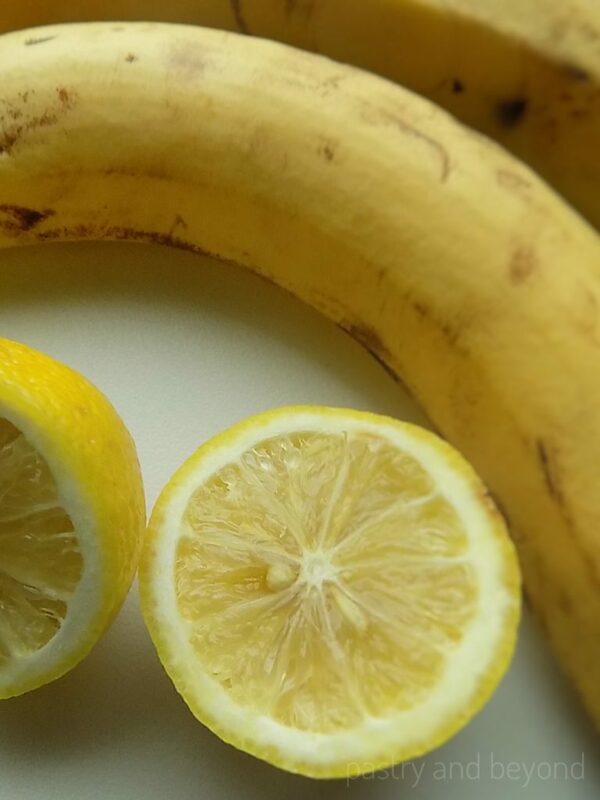 Lemon juice prevents bananas from turning brown. It also gives a tangy flavor which I love and lemon means vitamin C, so it is all healthy! First I peel the bananas, and then cut them almost into 1/8 (3mm) thick slices. Later, I dip the slices into lemon juice and then place them on the baking sheet covered with parchment paper. After that, I put them into the oven. At the end of 1 and 1/2 hour, they shrink, become chewy and less sticky. I remove the baking sheet from the oven to flip them over with the edge of my knife. Then, I put the baking sheet to the oven again and bake for extra 45 minutes, until they are crispy at the edges and chewy in the middle. The baking time may vary from oven to oven so you should start checking your oven after 1 and 1/2 hours. I keep the dried bananas in the turned off oven for 15 minutes. As they cool, they become crispier. I love them chewy-crispy but if you want to eat them all crispy, you need to bake for additional 30-45 minutes. That’s all! 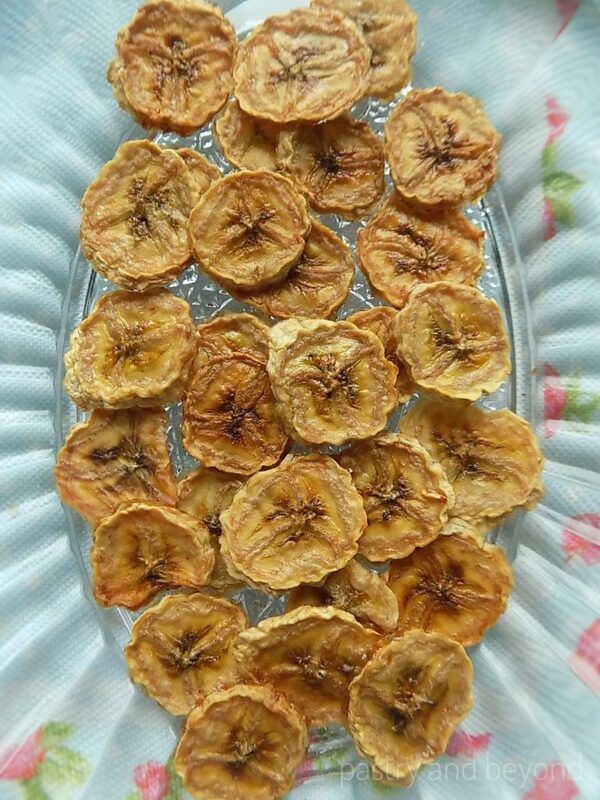 If you also like dried apples, you should check my Oven Dried Apples! 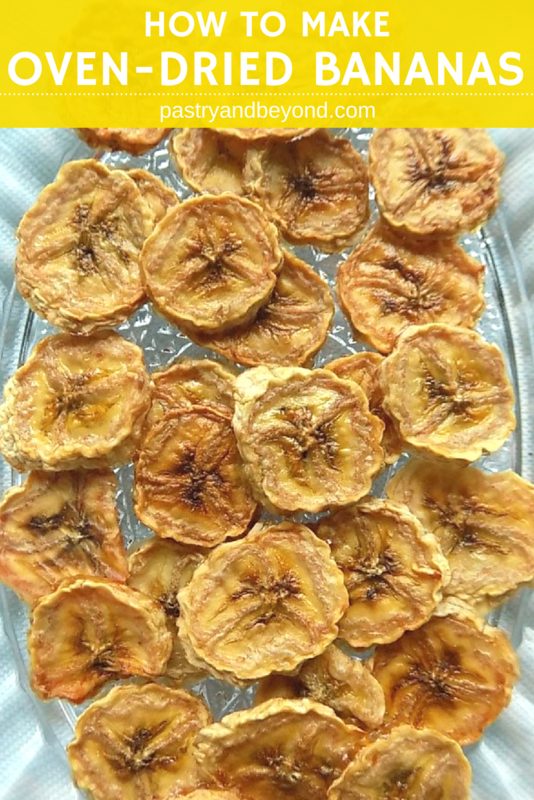 You can learn how to make dried bananas easily - either crispy or chewy! Preheat the oven to 200°F(95C°). Line baking sheet with parchment paper. Squeeze the lemon and set aside. 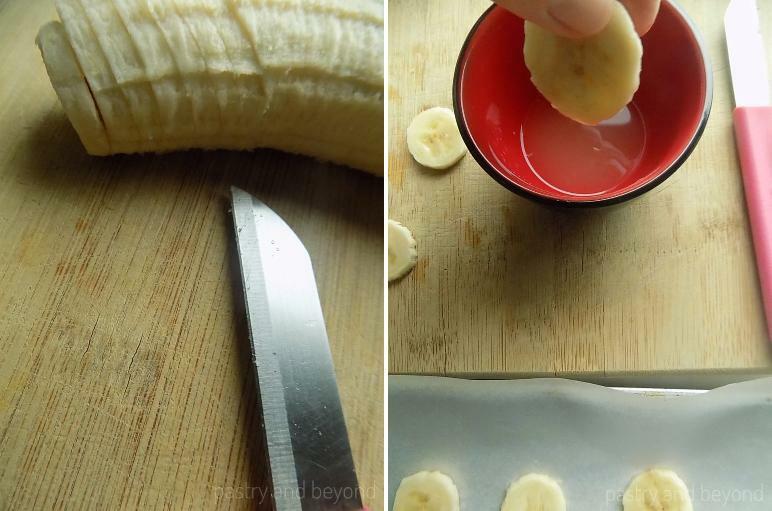 Peel the bananas, slice them into almost 1/8 (3mm) thick slices. Dip the slices into lemon juice. Then place them on the baking sheet covered with parchment paper. Bake for 1 and 1/2 hour until they shrink, become less sticky and chewy. Remove the baking sheet from the oven and flip them over. Place the baking sheet to the oven again and bake for extra 45 minutes, until they are crispy at the edges and chewy in the middle. Keep them in the turned off oven for 15 minutes. They will become crispier at the edges as they cool. 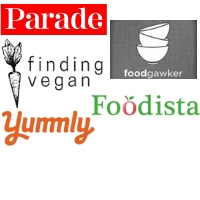 The baking time may vary from oven to oven, so you should check them. If you want to eat them all crispy, you need to bake for additional 30-45 minutes.